On her sixth studio release, the Shetland-born singer delves even deeper into the reaches of ambient-pop. The one-time front-woman for the now disbanded Goya Dress releases her sixth album, We Go to Dream, expanding on the explorations with electronic music of her last effort, 2011’s Pulse. 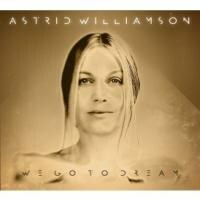 Shetland-born Astrid Williamson delves even deeper into the synthetic grooves of ambient-pop, this time infusing the heavy, narcotic beats with the sensuous murmurs of dub. There is a golden warmth to these eleven numbers which burns through softly with a deeply meditative glow. First single “Hide in Your Heart” mines the bass-heavy British soul of Massive Attack, lightly sketching the contours of the song with the airs of synthesizers. On the more dance-floor friendly “Loaded Like a Gun”, Williamson presents a moody treatise on war, offering a position of anti-violence and pro-feminism with lushly heartbeat-driven rhythms. The singer hasn’t put away her instruments of choice with which her songwriting has become synonymous; the frosted beauty of “Vermillion” sees the return of the acoustic guitar and on the elegiac “Scattered”, Williamson revisits the piano as though it were an old friend she hasn’t seen in a long time. Other numbers return to the shadowy, atmospheric haunts she explored with Goya Dress, like the Celtic-flavoured “Captured” and the slightly baroque “My Beautiful Muse”, a supple sway of late-night jazz riffs. The one constant, however, is Williamson’s distinctive voice; strange like autumn and full of breath, it glistens like a once-perfect ice sculpture melting slowly in the sun.